In two complementary reports, we looked at these issues across educators in the states of Illinois and Nevada. Across both states, we found that women typically earn lower salaries than their male counterparts. 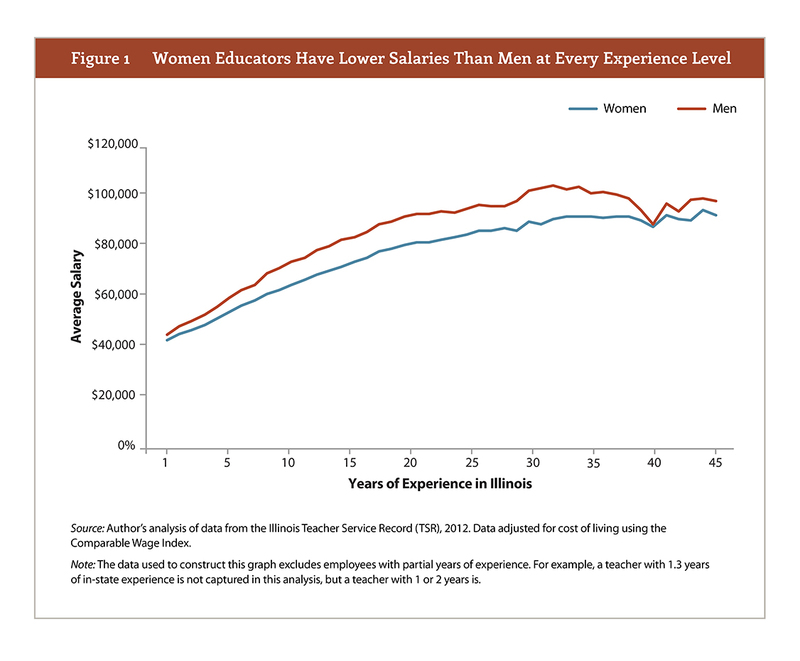 The average salary for female educators is $5,500 lower than that of their male counterparts. As shown in the graph below, women earn slightly lower salaries in their first year, and the disparity increases until around their 30th year of service. The salary gap at 10 years of service is particularly important because that is the time when educators vest into the state pension system. In their 10th year, women earn an estimated average annual pension benefit that is $2,000 less than men. By the time an educator retires after 30 years, the average annual pension is $10,000 lower for women than men. That yearly inequity is considerable and adds up throughout retirement. In Nevada, educators lose out by being included in a state pension system that includes other non-education public employees. 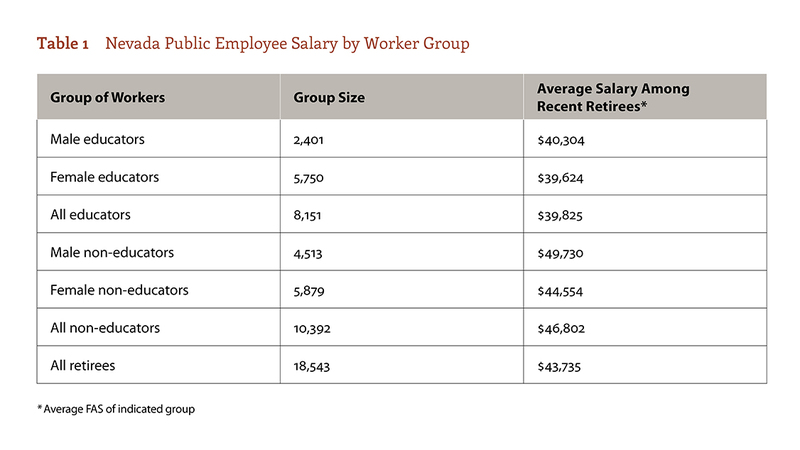 Educators typically have salaries that are $7,000, or 15 percent, lower than that of their non-education peers. As shown in the table below, this is most harmful for female educators. And although female educator retirees qualify for annual pensions worth slightly more than those of male educators, both groups trail non-educators. On average, educators are drawing pensions that are worth $4,000 less per year than those of their non-educator peers. Pensions do provide guaranteed monthly payments for life, which disproportionately benefit women who live longer. But that may not offer much solace to a practicing teacher who earns less money than her male colleagues during all her working years. In fact, the average woman’s total pension wealth only begins to catch up to her male colleagues if she lives to collect benefits well into her 80s and 90s. The education sector is not free from the gender pay gap, and the consequences of that inequity affect not only a woman’s take-home pay, but also her retirement and long-term financial security. Truly fixing this problem will require reforms to both how districts and schools pay educators, and how they structure their retirement plans. Download the full reports on Illinois’ and Nevada’s pension system. These reports originally appeared on our sister site, TeacherPensions.org.